Posted on December 13, 2015 at 2:55 pm. Saturday’s surprise snowfall in Newcastle may not have been too welcome for many Northern residents still trying to recover from the recent floods, but to two of our dogs at Happy Paws it was just about the best thing they’d ever seen. Oscar and Murphy had their first walk together and boy was it a memorable one. The snow started to fall heavily about an hour before we were due to begin our walk in Chapel Park and by the time the hour arrived there was a good inch of snow covering the ground. I brought tennis balls as Oscar takes Labrador ball love to another level. He’s not happy until he has a minimum of two in his mouth and then he’s on red alert for any unsuspecting dog who leaves a ball unattended. The game of fetch the tennis ball seemed even more attractive to our two canine friends than usual given the snow. Poor little Murphy tried gallantly to retrieve a ball but never had a chance against the reigning champion, Oscar. Oscar has a habit of leaving one ball to chase another or even to follow the scent of something enticing before returning to pick up the original ball. This tactic is great under normal conditions but in this weather we soon found ourselves down to one ball. Game over for now, so we set off on a wonderful walk through a winter wonderland and met a few other lucky dogs enjoying the snow. Murphy had the time of his life, following Oscar as a small boy follows his older peer, wide eyed and tail spinning like helicopter blades. Our blissful walk was only briefly interrupted by Oscar nicking a friendly dog’s ball and a ten minute scramble by the owner, me, Murphy and said dog trying to retrieve the stolen goods. Tennis ball safely returned we finished off with a final game of fetch and a mammoth drying session. 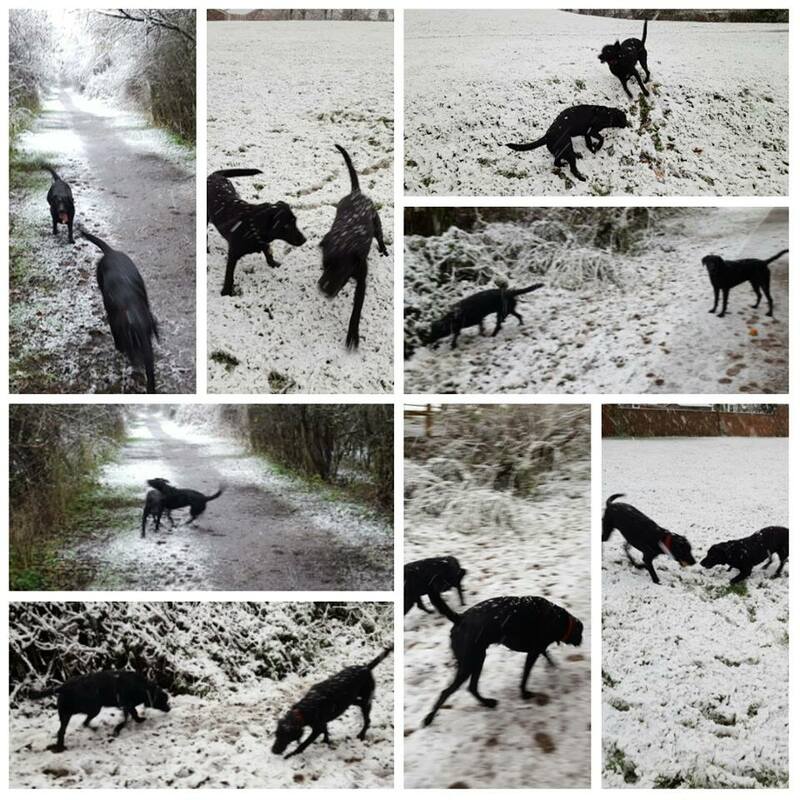 The snow has all but gone now and who knows it may be the last we’ll see at Happy Paws this year but at least our two boys enjoyed its brief appearance.